At the time of this post, the video of us meeting Snow White at our Walt Disney World Princess Breakfast is currently hovering at 1,959 visits. While I have monetized several of my YouTube videos, this is the only one that is really actively searched (and then viewed). I am going to track its progress to see how it does and report on what works and what doesn’t (pre-roll ads vs in-video, linking on other sites, etc.). And the title was, “Sophia the First Meets Cinderella at Walt Disney World Princess Breakfast“. On November 10th 2014 it was changed to, “Disney Princess Breakfast: Sophia the First meets Snow White“, and also got its current thumbnail – an image taken by my wife Beth. Before then it was an image auto-generated by YouTube. I was reluctant to use an image other than what YouTube selected, because in my opinion the person clicking on the video should see a depiction of what is really going to be in the video. 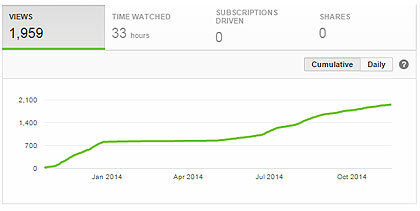 However for this project, I want to see what customizations help (or hurt) the progression of views for the video. Ultimately, I want the Sophia / Princes Breakfast Video to become the number one viewed video for people searching “Disney Princess Breakfast”. Sometime this month (In between work, kids, and Christmas shopping), I will transcribe the audio track in the Princess Breakfast video. YouTube offers an Automatic Captioning Service, but not for this particular video; am guessing because the audio was not of a good-enough quality (it is pretty muddy between the canned announcer voice-over predominantly heard in the video, and our voices) so I will be doing it by hand. Once I have that completed, I will roll out new translations one by one, to see if that appears to have an impact on views of the video. This page has a pdf that you can download.